“At Table we believe food is more than food”, says Rob Caslick, founder of Table and Two Good. 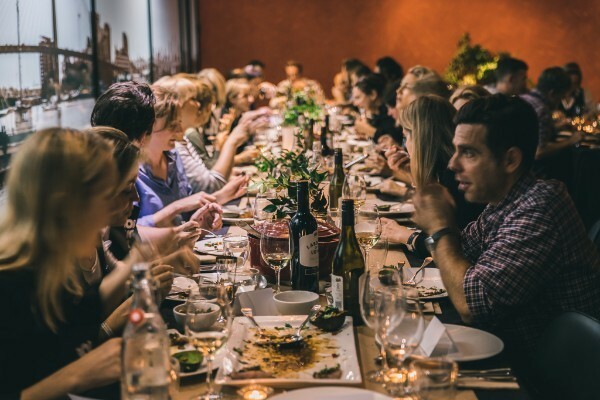 “The Kitchen Table Cooking School teaches the power of good food to young and new parents, and works to create some beautiful and positive food memories for everyone who participates”. On Tuesday night we were very proud to have styled the fundraising event to support the upcoming Kitchen Table Cooking School, hosted by the Sydney Fish Market Cooking School. Through the volunteering work of the Two Good crew, the Davenport Campbell team and the chefs, the night hit the funding target. This will directly support the ‘Young Mums Cooking Course’ 6 week programme which teaches young mums in difficult living situations how to cook healthy meals for their children. The evening featured chefs Mike McEnearney from Kitchen By Mike and Danielle Alvarez from Fred’s. Our guest chefs demonstrated how to prepare a nourishing 3 course meal. All 60 participants worked in teams around a cooking station and prepared the meals demonstrated by the chefs. The sense of community was contagious! Everyone then proceeded to the beautifully styled dining room to enjoy their cooking and share their stories. We are incredibly honoured to be part of a such a hugely successful event.